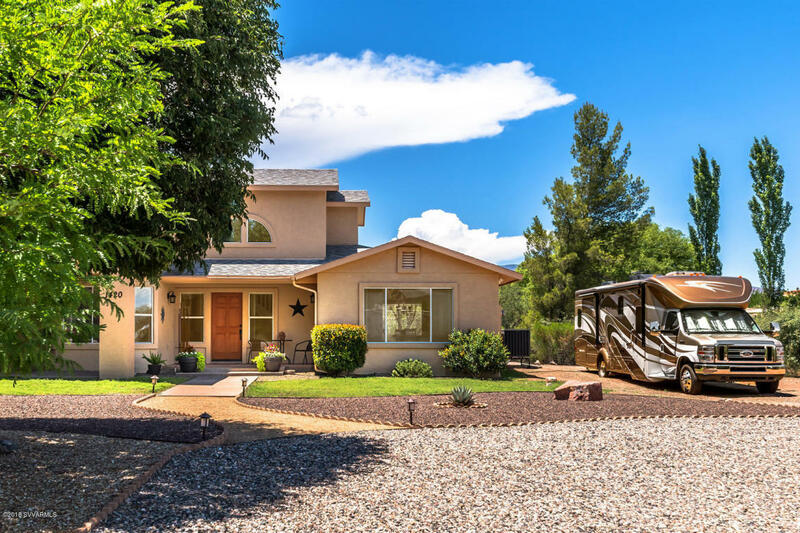 Cul-de-Sac 1 acre+ estate is a rural oasis in the city; peaceful & quiet with unobstructed mountain views in back to Red Rock views in front. No HOA! Exquisite upgrading in 2017 reflects sellers pride of ownership. Exceptionally large master suite upstairs has room for an office, nursery, or library. Open the master patio door for fresh country air or sit outside & enjoy the red rock views, trees & birds. Grand large walk in closet. Free standing bathtub that borders a large window to gaze at stars at night or Mingus mountain during the day. RV parking on both sides of house. Ornate, low maintenance back and front landscape, with additional land for your needs: pool, gardens, meditation areas? Kitchen is open with lots of natural light & custom designed for entertainment.Hurry to see!